Web design development Portsmouth VA | VISIONEFX provides website design to business in Portsmouth, VA. Our company has enjoyed an on-going relationship with Garage Concepts for over 6 years in support of their website. VISIONEFX designed an easy to use website where customers can easily navigate to the wide range of products offered by the company. 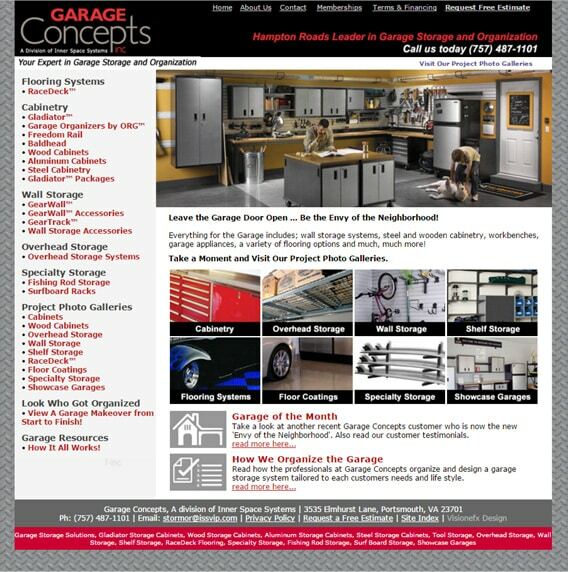 Garage Concepts has offices located in Portsmouth, VA. When your searching for Web Design Portsmouth VA – Web development Portsmouth look no further than the web design experts at VISIONEFX. VISIONEFX serves business owners in Portsmouth VA. We provide extraordinary web design throughout the United States. Our services to include; custom web design, web development, e-commerce web design, Word Press web design, Joomla web development, SEO and web maintenance services. Call: (757) 619-6456 or email info@visionefx.net. For more information contact us here.